Clinching (sometimes spelled “clenching”) is when you drive a nail that passes through both thicknesses of wood you are fastening. 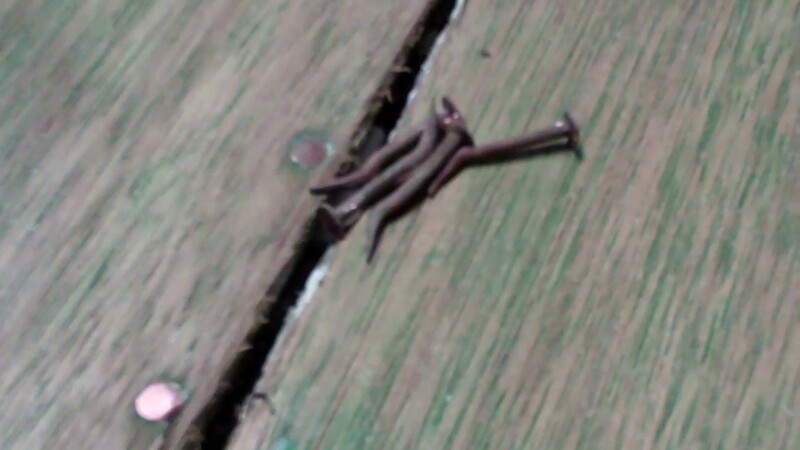 The tip of this nail sticks out about 1/4” and is bent over and driven into the wood. That is all and good, but how about the poor person trying to repair or restore a wood boat like the 1942 Century Imperial Sportsman that has been clenched? If you can get to the edge of a board so fastened, and there is room for the tool, the nails can simply be cut off using a tool like a Fein MultiMaster.. It is quick, clean and relatively easy to execute. It also leaves the tip of the nail imbedded into whatever framing the nail was clenched to. Woe be unto the unsuspecting person who reaches in there with a fine handsaw or worse, has released the frame member that is too thick for some reason and runs it through his/her planer! Those blades are anything but free! Seeing me with the Fein tool in hand, RJ suggested pulling them with a simple hand tool, a staple or upholstery tack puller. Voila’! Yes, a bit of patience and care is involved, but the tool can be gently inserted beneath the nail’s head, which is then carefully rocked upward to reveal its shaft. Shifting to a six inch, very fine flat bar is the answer. Levering it slowly caused the nail to rotate as it was releasing, thereby leaving only a very small hole behind, one that is easily repaired with toothpicks and Gorilla Glue and faired. I do not recommend this method on planking that is finished bright as it does tend to tear the edges of the holes left behind on the outer surface’s. Here I would go back to the Fein tool method so I could either clench anew or use silicon bronze wood screws during reassembly. Do not try to pull the nails out by hand! I did so and yelped. That copper head’s edges are super sharp. Putting your heart into your work is one thing. Bleeding on it is quite another!